The Mann Axe & Tool Co., Ltd. is believed to have been the successor to a couple of earlier axe making concerns that were located in Canada, substantially in the same place. One in particular was the Maritime Edge Tool Co. 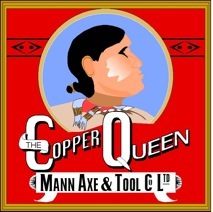 When the American Axe & Tool Company was formed in 1889, four of the original founding axe manufacturing companies included the name Mann. A number of the individuals that joined the company were also named Mann. One of them was James H. Mann and he became the company secretary. Within four years some of the original participants were eager to withdraw but doing so presented a variety of problems. One of those problems involved the use of brand names. When the A. A. & T. Co. was formed all the brands belonging to the various founders became the property of the parent company. James H. Mann left the secretary’s position in 1901 and started to operate an axe making business under the name James H. Mann & Co. Not long after that James retired (between 1904 and 1908) but his three sons continued in his place. One way was to become involved in the axe business in Canada. That led to the start of the Canadian Mann Axe & Tool Co., Ltd.
Due to the control of a major portion of the market that the A. A. & T. Co. had, some members of the Mann family sought to reestablish themselves under new names. One decided to get reestablished via a Canadian association. The axe manufacturing industry in Canada was doing quite well but it too was in a state of change. Taking advantage of that, one of the Manns, namely James H., is reputed to have used an intermediary to buy into the reorganizing of what had previously been known as the St. Stephen Edge Tool Co. It may well have been that James H. was also attempting to bolster up the futures of his three sons; Frank E., Walter and Percy G. It is known that James turned over the James H. Mann Co. to them not long after the turn of the century. The new company took on the name of the Maritime Edge Tool Company. The initial reorganization that resulted in the Maritime Edge tool Co. was in 1900 and the company operated under that name alone until 1911. The business climate had apparently changed enough by that time for the company to reorganize yet again. This time the Mann Axe & Tool Co., Ltd. emerged as a manufacturer substantially at the same location as the Maritime Edge Tool Co. The company also operated as or marked their goods with the name Mann Axe Co., Ltd. It has been reported that the name of the Maritime Edge Tool Co. continued to be used until 1922. Quite possibly the labels marked Mann Axe Co. were used after that. Sometime after 1911, possibly in the late teens, the Mann Axe & Tool Co., Ltd. entered into an agreement with the city of St. Stephen that was intended to result in the construction of a new axe manufactory. Whether intentionally or because of other circumstances, the legal documentation for the deal was never finalized. 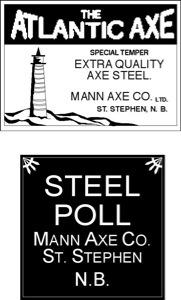 The Mann Axe & Tool Co. continued to manufacture in St. Stephen until 1923. After that, and continuing until 1943, they are reported to have functioned as agents. Whether they marketed their own products that were made elsewhere or marketed products of other manufacturers is not clear. 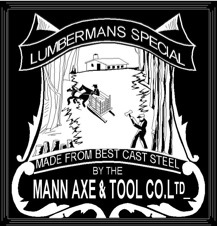 The existence of the Mann Axe & Tool Company, Ltd. is listed in various directories and business gazettes, but the affiliation with a specific branch of a Pennsylvania based Mann axe making company has been somewhat elusive in regard to documentation. As noted above, that affiliation was with James H. Mann and then with his sons when they were operating out of Yeagertown, Pennsylvania. The US entity eventually became involved with Collins & Co. and was ultimately purchased by Collins & Co. The full details of what happened to the Canadian entity are still vague. The IXL brand was adopted by the Mann Axe Co., Ltd. from another user of basically the same label, Canadian Foundries & Forgings, Ltd. Stamping observed on Canadian made axe. 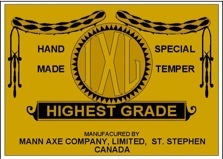 Label used by the Mann Axe & Tool Co., Ltd that was almost identical to one of the labels used by the James H. Mann Co.
Facsimile of a label depicted in a Canadian Wholesale Hardware Co. catalog. Facsimiles of labels used by the Mann Axe & Tool Co., Ltd. Stamping used on some axes and interpreted as a brand but it was actually a pattern. A booklet on the Mann Dynasty of Axe Makers is now available. Please refer to the Home Page for details. The booklets have more information than on this website. This company is also included in the CANADIAN AXE MAKERS booklet.